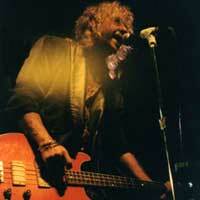 Find Night Ranger websites, mailing lists, chat rooms, and other music links here! We specialize in progressive rock, progressive metal, 80s rock, 80s metal, 80s new wave, melodic rock, AOR, and more! Night Ranger were formed after members Jack Blades, Kelly Keagy, Brad Gillis, and Alan Fitzgerald got together in the bands Rubicon and Stereo. Their debut album, Dawn Patrol was released in 1982, with the hit 'Don't Tell Me You Love Me'. In 1983 they released their second album, Midnight Madness, which had several hits, including '(You Can Still) Rock in America', 'When You Close Your Eyes', and probably their biggest hit, 'Sister Christian'. This was followed by 7 Wishes, Big Life, Man in Motion, a Greatest Hits collection, and Live in Japan (which was released pretty much without the band's knowledge by MCA). Night Ranger have said that they have a new studio album in progress, but they've taken the rest of 2006 off to work on their side projects. Hopefully we'll be hearing more from them in 2007! Official Site. Run by Artist. The band has contributed to this site. News, Tour Dates, Bio, Discography, Fan Club Info, Mailing List Info, Photos, Merchandise Info, Forums, Contact Info, E-mail Address, Links, Booking Info. Fan club and online store are 'coming soon'. Official Site. Run by Record Company. The band has contributed to this site. Bio, Photos, Sound Files, Contact Info. Site created for the Neverland CD, but doesn't seem to have been updated since. Has information on how to leave a message or question for the band, but it may not still be valid. Run by Fan. Interviews, Photos. Run by Fan. Photos. Had photos, but they all seem to be broken links now. Run by Fan. Photos, Sound Files, Links. Run by Fan. News, Tour Dates, Discography, FAQ, Interviews, Photos, Sound Files, Forums, Links, Screensaver, Desktop Themes. Hosted on MSN. Bio, Discography, Sound Files, Video Files, Links. MSN Forum where messages can also be sent to you via e-mail. To subscribe, follow the link above. Official newsletter. To subscribe, follow the link above. Original Release Date: 1983. MCA. United States. Original Release Date: 1982. MCA. United States. Original Release Date: 1985. MCA. United States. Original Release Date: 1987. MCA Special Products. United States. Zero Corporation. Japan. CD Single. Sony. United States. CD Single. Original Release Date: 1988. Japan. MCA. United States. Original recording remastered. Original Release Date: 6/30/1998. Brilliant. United States. Live recording. Original Release Date: 7/6/1999. Big Eye Music. Original Release Date: 1988. MCA. United States. Original Release Date: 1985. Japan. Japanese import. Original Release Date: 1983. Japan. Japanese import. Original Release Date: 1982. Japan. Japanese import. Original Release Date: 10/23/1990. MCA Special Products. United States. Original Release Date: 1982. MCA/Boardwalk. United States. Madacy Records. United States. Live recording. Original Release Date: 11/15/2005. Irock Entertainment. United States. Seems to be more 'Hits' than anything else. Has one acoustic track, 'Sister Christian (Acoustic)', and one live track, 'Don't Tell Me You Love Me (Live in Tokyo)'. Original Release Date: 1983. Lemon Records. Double Play (Int600). United States. Original Release Date: 1985. Beat Goes On. Digitally remastered.